Dundee United manager Jackie McNamara will be in the dugout for Saturday's Scottish Cup semi-final against Rangers after appealing against a ban. The club are challenging the three-match touchline suspension 40-year-old McNamara received on Thursday. A five-match ban, two of which are suspended until the end of next season, was doled out following a confrontation with St Johnstone's Tommy Wright. It was McNamara's third breach of disciplinary rule 203 in three seasons. 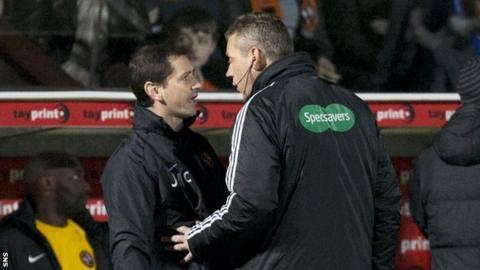 McNamara and Wright were sent to the stand by referee Crawford Allan after their heated exchange at Tannadice last month. And Wright received a one-match ban from the Scottish FA, suspended until the end of 2014.